This past Wednesday we began the long drive south to visit our friend Mogodi and his family, and the school we established in their camp, and in just a few moments I'll tell you all about that visit. But first this. On our way south, we stopped in Okigwe where we'd been invited by a friend of Mogodi's, Alhaji Mohammadu, to evaluate their school situation and possibly help. A group of Okigwe Fulani, led by their chairman, met us at the military check point along the road, and took us to see the two school buildings provided by the local government for their over 500 children then gave us a little tour of a nearby Fulani compound. 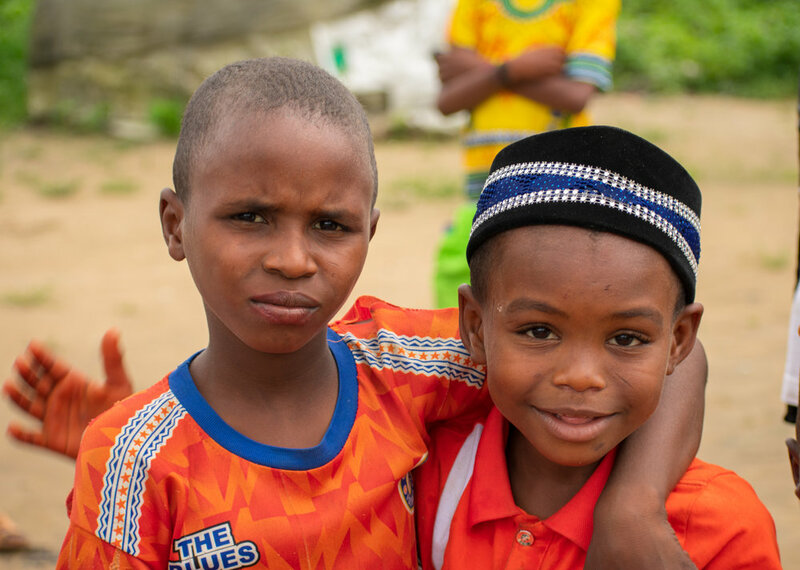 These Fulani are requesting help to build two buildings of six classrooms each, and to buy the bus needed to carry distant children to school. Would one of you reading this story like to adopt this very worthy project? We're on our way back to Abuja now, after an incredible weekend spent with Mogodi, (yes, I'm getting to that!) to prepare for another long drive to Bobi Reserve this coming Monday. Bobi is another of our favorite places in this country and we can't wait to see all our children in that place! One task we must accomplish before leaving Monday is the extension of Shane's visa. The DCI, or Deputy Controller of Immigration, has agreed to extend Shane's visa, (due to expire September 7,) all the way to December 14, to give us time to either secure him a work permit through the Federal Ministry of Agriculture. And now, finally, on to the 5 Things We LOVE about Mogodi's Camp School! "All you need is love, pam, pam, pa ra ram. All you need is love, pam, pam, pa ra ram, All you need is love, love - love is all you need!" This weekend has been ALL about love! From the lyrics our driver Lawal uses as his new ring tone, " I just called to say I love you!" to the magic moment, the HIGHLIGHT of my weekend, when little Shuaibu, my miracle child, who'd been sticking to me like glue all morning, grasped my hand in both of his, looked up at me with those big, brown eyes and said, "Phyllis, I looove you!" People, I'm telling you true, it just doesn't get better than that! So, what are the five things we love about Mogodi's Camp School? Let me tell you! 2. We love how they love one another! Mogodi and his family live in a compound of beautifully crafted huts, large and small, built alongside those of extended family members, relatives of his wife 'Mama Shuabu'. There are probably at least fifty in this extended family. Down a short path through emerald green delta grasses and palm trees, are two additional compounds that at least two hundred more Fulani call home. This large group has its chief, called the 'Wakili', and it's own Imam, or pastor. I didn't catch the Imam's name, but he was very friendly, sitting right next to me and Bature and visiting with us for several hours. When Imam called everyone to prayer for a baby recently born, he wouldn't let me leave the mat where I was sitting, so suddenly I was in the midst of a hundred Fulani men bowing and praying. All I could do was bow my head and pray as well. Please join me in praying for the Fulani. During the three days we spent with Mogodi and his family, this entire neighborhood of two hundred and fifty plus people got together for dinner TWICE! It's like, they cannot get enough of each other's company! The two occasions were 'naming ceremonies', where two new babies were being celebrated and formally named. We were invited to both get-togethers and were so impressed by the love and unity we witnessed there. These are people that live side-by-side, but by the way they react when they see each other, you'd think they were long lost brother and sisters! But it's love, pure and simple. They love each other and are content to spend every waking moment with each other! And we were drawn in and included in this love! What an amazing experience. 3. We love their camp and traditional food! Shane and I sat under shade trees for the first celebration meal, but were ushered into a hut of one of the leaders to eat our dinner, today. This one room hut, a typical Fulani home, was cement-floored, with wood and tarp sides and a thatched roof. It was as neat as a pin, with everything carefully arranged and in it's place. Two beds were set against the walls, with mosquito nets folded and tied neatly above them; a small table with two chairs completed the furnishings. For our meal we were served a bowl of sticky rice alongside one of melted butter and given a third bowl containing fresh cow's milk! The cows were right outside the door, and had given us their milk for breakfast! As I drank this raw milk, I couldn't help but remember the first time I drank such milk and was sick for a week! But this time I seem to be handling it okay! 4. We love Mogodi's Camp School! We were able to get everything in order for September 10, the opening day of school. We bought lumber, cement and zinc, are renovating the school structure and building several more desks to accommodate the large number of children expected this year. Mogodi and I interviewed and hired three new teachers, all of whom live right in the neighborhood. Together with parents, teachers and the Wakili, we discussed the upcoming year, the election of a new PTA chairman, security and maintenance of the school. Mogodi took the teachers into his room and assured them of his full support, telling them to come to him with any problem or issue at all, that he was there for them. Later, I told the teachers that they must love these children, respect them and their parents and faithfully pray for them. 5. We love serving God among the Fulani. From that moment in Ekparakwa when I witnessed my first cattle drive - when I first met Mogodi and his family - to this moment today, living and working with the Fulani people has been nothing but pure joy. Yes, there have been troubles and failures, some steps forward, more steps back. But still, pure joy. The greatest of things we can give the Fulani people is love. Love, straight from our hearts to their hearts. Love. And it is only love that will win them over in the end. Remember those two songs I mentioned at the beginning of this story? 'All you need is love, pam, pam, pa ra ram...', and, 'I just called to say I love you'? 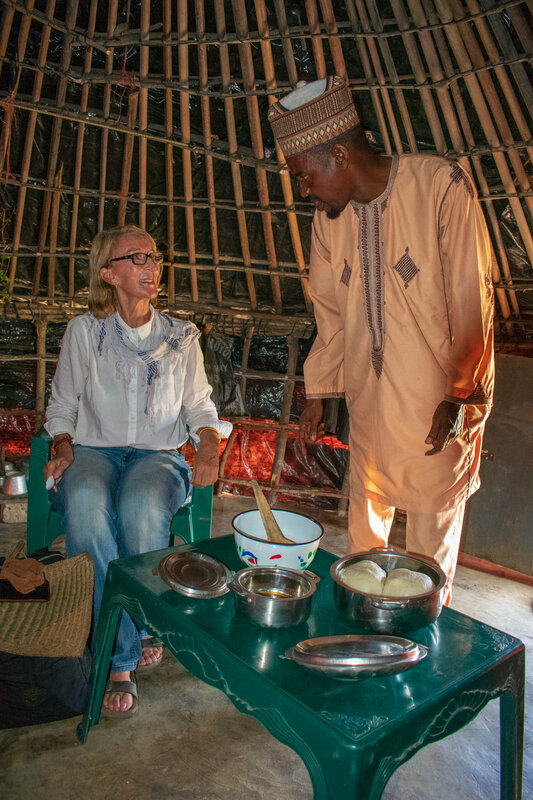 By the way, you too can fall in love with the Fulani and experience pure joy as well. Contact us through our website for more information.